Drones are the future and the future is now. And when it comes to learning with our Drones drones for education, sky is just not the limit! We offer a platform to integrate the use of drones with the concepts of STEM and STEAM education and aid the development of 21st-century skills, Computational thinking and digital learning. 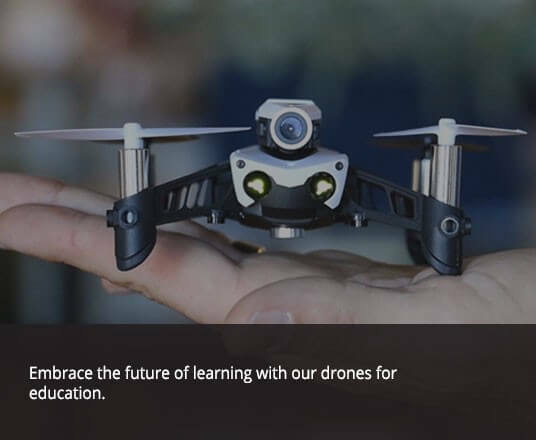 Give your students an amazing learning experience with the Parrot Mambo Drone. Inculcate a deep understanding of concepts like Robotics, Programming, Coding, Electronics, Mathematics and even Art. Parrot Mambo is a lightweight drone which is easy to pilot for young students. It has high precision sensors to guarantee remarkable stability in its flight manoeuvres with the simple and intuitive controls in the Free Flight mini smartphone application.